Back in 2007 a phenomenon was born on Earth. It provided a new universe for humanity to explore and new characters to interact with. Some even say that it changed the landscape of RPGs itself. It was quickly dubbed a classic by countless game reviewers. With the release of the Citadel DLC for Mass Effect 3 we have no choice but to admit to ourselves that there will be no more new adventures in the Mass Effect universe until the next game comes out, whenever that is. However, it behooves us to take the opportunity offered by this interregnum to look back and marvel at us what a remarkable achievement Mass Effect was. It's not going too far to say that Mass Effect changed a lot of for us, and not just in terms of gameplay mechanics. We weren't just confined to one world, or even one planetary system…Mass Effect gave us a whole galaxy to explore, and to do almost anything we wanted with it. We could be the sole savior of the galaxy, who stayed true to their morals and brought the galaxy together by leading by example, or a ruthless pragmatist who intimidated rather then motivated the galaxy into action.. We could flick across space in a cutting edge warship off to save the galaxy from threats both small and large. How large? Well…. When you think of all that, it's a wonder why anyone can have fun managing an individual household in The Sims. Oh, yay, I get to kick my character out of their warm bed at 6 AM. A whole new vista has just opened up for me. Sorry, I digressed. Anyway, it's a fact that, whatever anyone's individual opinion, Mass Effect has made a definite impact on this current generation of gamers. In the future, though, when the gamers of tomorrow look back upon the series- however long it's going to be- I don't think it will be remembered just for the changes to the mechanics of gaming, but for the memorable characters Bioware created and for they myriad ways they could interact with each other. The great thing about the characters we came to know in Mass Effect is that, by and large, we could grow to know them along with Commander Shepard. This allowed the bond that was developing with these characters to split; there was Commander Shepard's relationship with them, and there was ours. The stroke of genius that Bioware had with these characters was that the reaction you had to them could also become Commander Shepard's attitude toward them, and your emotions that prompted these choices could literally alter the game, for good or ill, in ways both large and small. This makes the most powerful moments of the game, like the one below, all the more powerful because it's your words, your connection to the events and the people wrapped up in it, that are pushing the game forward. The crew of the Normandy did come to us as strangers and they did leave us, as Commander Shepard puts it, as "allies and friends". Our adventures with them may be over, but we'll always have the memories. I've not got much else to say, but I did want to end this piece on a picture, and a toast. The media used in this article is the moral, intellectual, spiritual, and otherwordly property of its' creators and licensers. 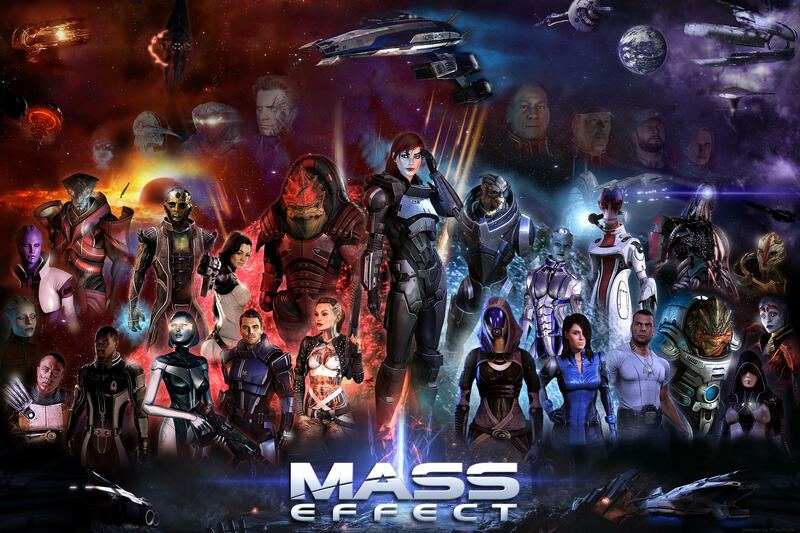 Special thanks goes to Deviantart member TheJTizzle for his Mass Effect poster that he very kindly allowed me to use in this article. You can find more of his work at http://thejtizzle.deviantart.com/.